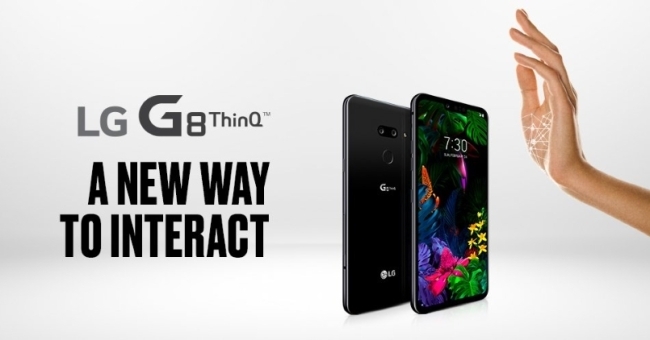 South Korean tech firm LG Electronics said on March 21 its new flagship smartphone, the G8 ThinQ, will officially go on sale in the domestic market this week. The G8 ThinQ is priced at 897,600 won ($796) and will hit store shelves on March 22, and be available in the North American and European markets in the coming weeks. The price is slightly less expensive than the Samsung Galaxy S10e, the “budget model” of the tech giant‘s latest flagship phone that is priced at 899,800 won. The G8 features a front-facing camera based on 3D technology that offers enhanced security and supports advanced applications, as well as using time-of-flight technology. The 4G flagship phone utilizes its OLED display as an audio amplifier for better sound quality during playback. The G8 is the world’s first smartphone with advanced palm vein authentication, made possible by the combination of the ToF camera and infrared sensors. It also features Air Motion, which allows users to answer calls, switch between applications or adjust the volume without touching the phone. LG said it plans to release its first 5G smartphone with a detachable secondary screen in the first half but didn’t specify its schedule or price range.